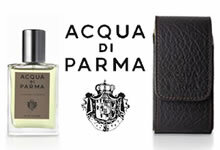 Acqua di parma have released thier Christmas Gift Sets for 2008. Acqua Di Parma is a traditional fragrance house that was created during the 1930's. Its signature fragrance Colonia was destined to become a classic throughout the world due to its simplicity, sophistication and Italian styling. Today Acqua Di Parma is also a complete line of prestigious products, dedicated to the care and pampering of oneself and to moments of freedom and relazation within ones own surroundings.